Making a story come alive is such an important skill for new readers to learn. One great thing to try is reading a wordless or nearly wordless book, and add sound effects, speech or thought bubbles, and narrative. Here are some fun books that preschoolers through 1st graders will have fun with. Since they contain very few words, they aren't daunting for new readers. But you still have to work at figuring out the story and making it come alive. Bobo is a little chimp who wishes he were a lot taller. Alborough uses expressive illustrations and very few words to show the little guy's attempts to feel bigger. At first he stands on a boulder, and proudly exclaims, "Tall". But then a lizard comes along, and stands up straight, making Bobo feel small again. The friendly lizard allows Bobo to climb on its shoulder, and once again the little chimp is tall. The sequence repeats itself with many more animals coming along. My first grader had a great time adding emotion to each proclamation, sound effects of the animals walking through the forest, and narrative of what Bobo was thinking. Bobo is featured in two other nearly wordless books by Alborough: Hug and Yes . Jack, a cute little dog, and his family wake and get ready for their day, going through their busy morning routine that will be familiar to young readers. The little boy gets distracted and forgets to feed Jack, even though Jack tries his best to get noticed. Schories does a wonderful job of using clear, expressive illustrations to convey the action and feelings of the characters. It makes a perfect book to add dialog, sound effects and invented narrative. There are several other Jack stories, including When Jack Goes Out , Jack Wants a Snack , Jack and the Night Visitors , and Jack and the Missing Piece . You might recognize Pat Schories' illustrations from the classic early reader series: Biscuit . As a parent, I've sometimes found reading wordless books daunting. At times, I've wanted an easy script to follow without thinking. Even if you've found wordless books awkward, give them a try. The open so much up for your children, giving them the power and ability to get into a story themselves without depending on you to decode the words. If you want to explore more wordless books, take a look at this review by Children's Literature. They provide a very comprehensive look at a wide variety of wordless books for new readers. The review copies came from our local library. If you make a purchase on Amazon using the links on this page, a small portion will go to Great Kid Books (at no cost to you). Thank you for your support. Two of our favorite stories this year were twists on classic fairy tales. Children love the way they combine fantasy, adventure and humor. We loved listening to The Thirteenth Princess , a twist on the twelve dancing princesses, and Ella Enchanted , a twist on Cinderella. If you have children in second through fifth grade, try listening to or reading these wonderful stories. Based on the fairy tale The Twelve Dancing Princesses, this retelling captures the imagination and enchants listeners. Zita is not an ordinary servant girl – she was banished by her father, the king, when his wife bore him no sons. Now, she can only communicate with her royal sisters in secret. After Zita’s twelfth birthday, her sisters fall mysteriously ill. The only clue is their strangely worn and tattered shoes. With the help of her friends—Breckin the stable boy, Babette the witch, and Milek the soldier—Zita follows her sisters into a magical world of endless dancing and dreams. The audiobook was wonderful, but is only available as digital download through Audible. Jenna Lamia’s narration brings alive Zita’s emotions and the court language, and captivates listeners with this magical tale. This is perfect for children who grew up loving fairy tales and are ready for longer, more complex retellings. The Thirteenth Princess will be released in paperback next month, and so is discounted in hardback right now at Amazon. Diane Zahler is coming out with A True Princess in February, based on the fairy tale A Princess and the Pea. We're very much looking forward to this book. The Thirteenth Princess has been nominated for the Cybils Fantasy award by Alyssa. For other reviews check out Charlotte's Library, Booked Up, and Rebecca's Book Blog. In this spirited retelling of the classic fairy tale Cinderella, a young girl is blessed by a fairy at her birth with the gift of always being obedient. But far from a blessing, for young Ella this fairy's gift is a curse for she must always obey whatever direct order is given her. She is powerless to resist, and must literally do whatever anyone asks. Ella is a feisty, smart young girl who discovers her true inner strength through the course of this story. Young listeners will love cheering for Ella as she outwits her cruel stepsisters; they will feel her pain as she falls in love with the prince and then decides that she will be too much of a liability for him, since she will have to do whatever anyone asks her to. Ella Enchanted won the Newbery Honor Award in 1998. The audiobook brings alive the characters with zest and humor. Narrator Eden Riegel captures a young girl perfectly, with both innocence and stubbornness. My 1st grader and 4th grader thoroughly enjoyed it. Listen to a sample from Listening Library/ Random House below. The review copy of The Thirteenth Princess was kindly sent by the publisher, Harper Collins. The review copy of Ella Enchanted came from our local library. If you make a purchase on Amazon using one of the links on this site, a small percentage will go to Great Kid Books (at no cost to you). Thank you for your support. Do you love reading outlandish tall tales with your child, seeing how preposterous they can get? 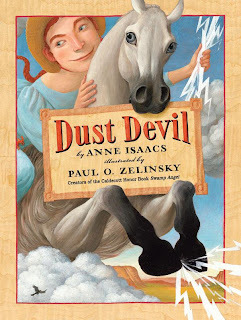 Dust Devil , by the award winning Anne Isaacs and Paul O. Zelinsky, will delight you again and again, and would make a perfect gift for any horse-loving, outdoor-loving, laughter-loving kid. Pair it with a model Breyer horse and a western saddle , and you have a great match. Angelica Longrider is hero who would give Paul Bunyan a run for his money. She's moved to Montana, a place wide open and perfect, after taming the marauding bear Thundering Tarnation in Isaac and Zelinsky's wonderful book Swamp Angel . Montana is flat as a pancake, with soil so rich that if you plant a seed before breakfast it will reach the sky by lunchtime. But Angel can't find a horse large enough for her to ride. When a dust storm covers Montana and rips the roof off of Angel's barn sucking up the oats, apples and hay, Angel leaps up into the storm and rides that bucking bronco until the dust washes away and reveals the perfect horse for Angel. "'Dust devil, it's time to quit horsing around!' she hollered, and without another word she sprang right onto the back of the whirlwind. The storm roared and bellowed, tossing buckets, goats and pitchforks in every direction, and tried to throw Angel off. Up into the sky she rode that bucking blast, latching on for all she was worth." Angel is a hero perfect to inspire any young girl that she can wrestle any bad guy out there, and do any job she wants to. No sooner than she finds a worthy horse, Angel sets out to rid Montana of the worst vermin to ride the land: Backward Bart and his Flying Desperadoes. Although the sheriff tells her that only men can serve as deputies, Angel shows that she has the wits and the strength to put Bart and the Desperadoes in jail better than the sheriff's deputies. Dust Devil has received praise from many quarters: The New York Times, Fuse #8, Kids Lit, and starred reviews from many journals. As a child, I loved playing with model horses. Breyer horses are classic, and the Baxter Morgan horse matches Dust Devil perfectly. Add a Western roping saddle , and you have a great gift for any horse-loving child. The review copy was kindly sent by the publishers, and then I purchased an additional copy for our home library. If you make a purchase using the Amazon links on this site, a small percentage will go to Great Kid Books (at no cost to you). Thank you for your support! A young girl asked me the other day, "But is it real?" Young kids are working hard to figure out what belongs to the world of just pretend and what belongs to the "real world". We want to help them make those distinctions, and yet ... and yet... Don't we also want to help them see the magic of our imaginations, the magic in our own real worlds? 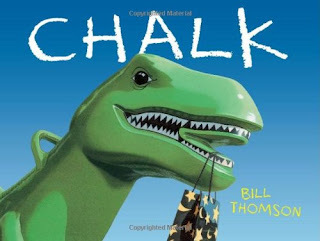 Chalk , by Bill Thomson, is an amazing wordless book that embraces and celebrates kids' imaginations in a very real way. It's one of my standout books of the year. One rainy day, three kids walk past the playground and see a bag of chalk hanging on a dinosaur's mouth. They look inside the bag. One kid takes out a piece of chalk, and draws a sun. All of a sudden, the clouds part and the sun starts to shine! What should the draw next? Butterflies? Butterflies lift off the ground, coming to life from their drawings. Thomson creates an exciting, magical story completely through his paintings. At first I was convinced these were computer generated, until I read Thomson's note at the end. All of the artwork was created through acrylic paintings and colored pencil sketches. His precision, perspective and details are truly extraordinary. Young kids will simply be amazed at this story. I'd even read it to 4th and 5th graders, talking about what inferences they make to understand what's happening. This would make a great gift, combined with some sidewalk chalk or even Crayola's 3-D Chalk with a note encouraging your child to make some magic of their own. For more about this great book, see the publisher's website: Marshall Cavendish. Especially noteworthy is Bill Thomson's essay about the process of illustration in Chalk . For other reviews, check out Charlotte's Library, A Year of Reading, Bookends, Kids Lit, and Scope Notes. Yes, it's getting rave reviews all over! The review copy came from my local library. If you make a purchase using the Amazon links on this page, a small portion goes to Great Kid Books (at no cost to you). Thank you for your support!